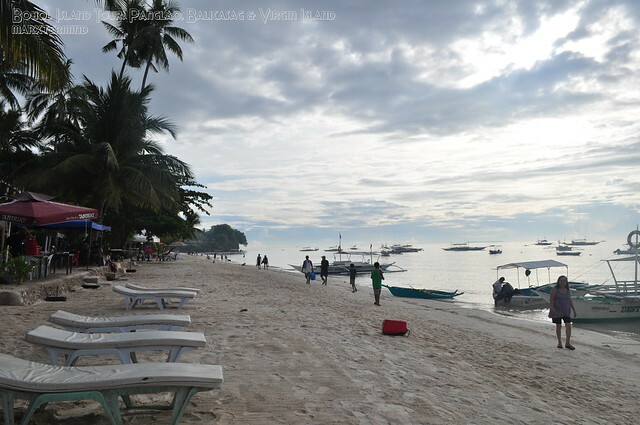 Bohol is one of the provinces in the country that has finest beaches. Aside from that, Bohol also has amazing underwater world to explore. Too bad I wasn’t able to experience diving during our vacation but for sure I’ll be back for that one. We stayed at Cherry’s Home Bolod House for PHP 3,500 a night which fits 10 persons. We were 14 all in all and the owner was kind enough not to charge us extra. It’s not a front beach accommodation neither a walking distance one. It’s 5 – 10 minutes ride from the beach and can be walked in 30 minutes. We contacted the owner for our transport to and from the beach during our stay (with extra pay). 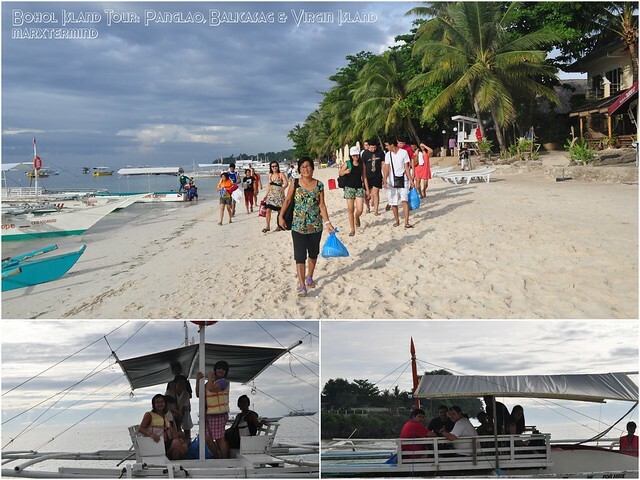 I contacted boatman Kuya Dodong (09081534117) for a tour to Balicasag and Virgin Island. 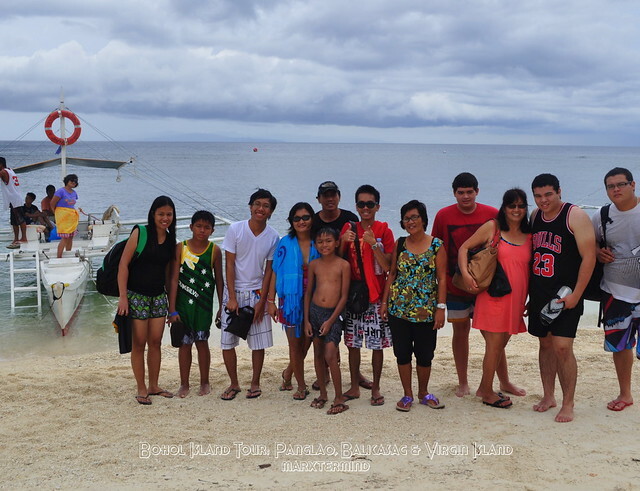 Rate was PHP 1,500 per boat which fits 8 to 10 persons. Since we’re 14 we rented two boats. He told me to meet him up 5:30 AM so we can have dolphin watching before doing the island hopping. With only few hours of sleep I was still able to wake up early. I woke up at around 5:00 AM but the bad thing was it’s brownout, no electricity, no lights. I started to wake up my Aunt Angie and my mom but they are unwilling to get up because it was so dark in the house. I was already worried that we might not be able to catch the dolphin watching. It felt like my relatives weren’t interested with my plan for the day And so when the sun started to rise, they get up and prepared our breakfast and food to bring during the tour. It was already 6:00 AM, still hoping that we can still pursue the dolphin watching. Our pick up arrived and off we went to the beach. I miss the beach. I was really in glee upon seeing it. Upon meeting our boatman, he told me that we can’t be able to see the dolphins anymore which really saddened me. So we’ll just go straight to Balicasag Island instead. 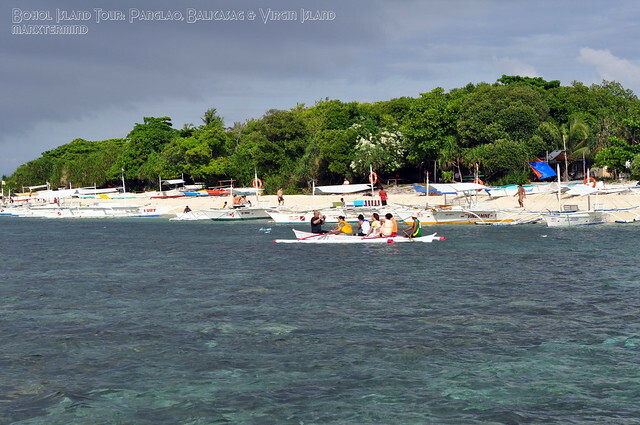 Balicasag Island is one of the many popular dive spots in the Philippines. There’s a coral sanctuary where you can snorkel. It was a long boat ride to get to the island. There were already number of tourists around when we arrived. The shore is mostly made of white pebbles. Upon arriving to the island, we ate our breakfast first in one of the cottages. The snorkeling area is still few meters away from the shore so one must take a small boat to get there. 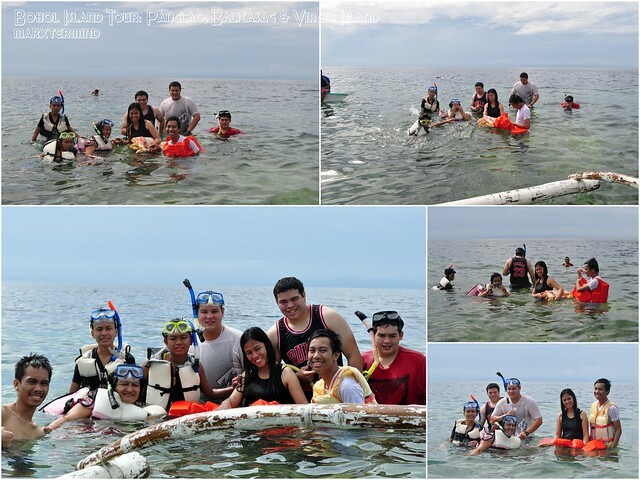 We’re 10 and each of us were charged PHP 300 (estimate) for snorkeling which includes the boat fee, water shoes rental and snorkeling gadget. I don’t snorkel often whenever I go island hopping since I have blurred eyesight. But I didn’t let this pass through as I want to see how the underwater scenery is. Despite of my blurred eyesight I can still see how beautiful the undersea is. Good thing I brought some bread to feed the school of fish. It was really amazing how these fishes get near to me whenever I feed them. There were sharp corals so good thing I rented water shoes. Sorry but I didn’t have an underwater camera to capture how beautiful it was . But we really enjoyed the experience and I can’t wait to see go snorkelling again. We went back to the shore and had our lunch. After awhile we decided to leave and go to the Virgin Island. Too bad I wasn’t able to explore more of the Balicasag Island, maybe next time when I go back. My mom took a pose while she was on the boat. Nagmamadali kasi lagi ayan sa boat ka na lang mag-pose! 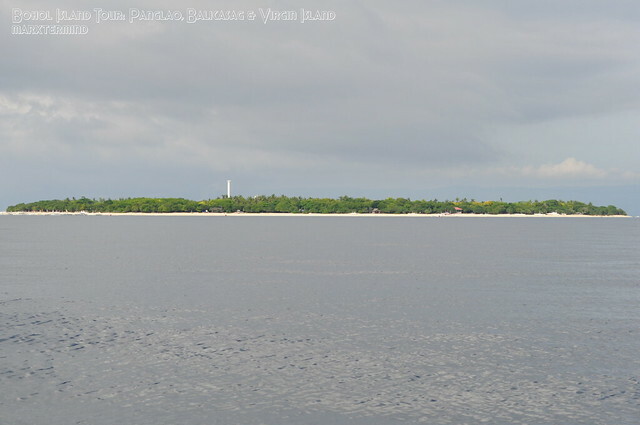 A small island few kilometres off the shore of Panglao. It was like a sandbar to me. According to our boatman this was where the movie Muro Ami had been filmed. It was already drizzling. We were welcomed by vendors when we arrived in the island. Some were selling pearls (but our boatman told us not to be deceived by those vendors) and also some were selling sea urchin. They said this sea creature can be eaten, weird! 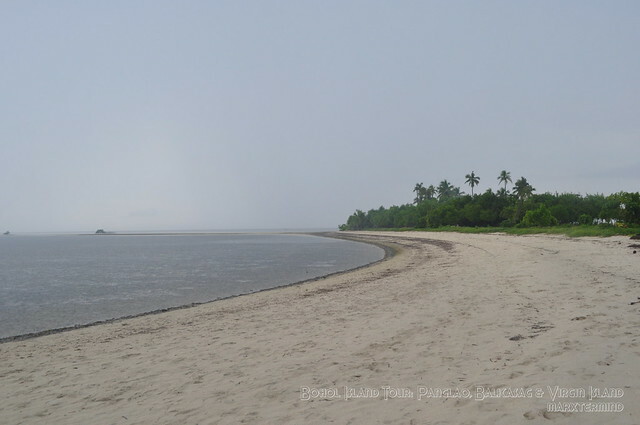 We started to explore the island by walking along the stretch of the sandbar. 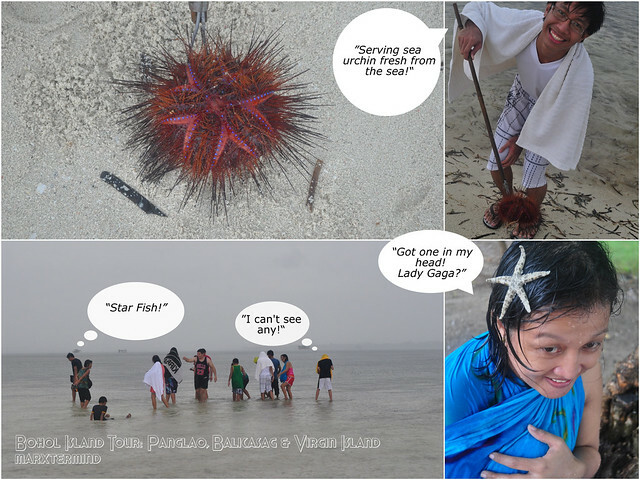 My family was fascinated by star fish. They looked everywhere to have one. From drizzle, it started to rain so we went back to the docking area. 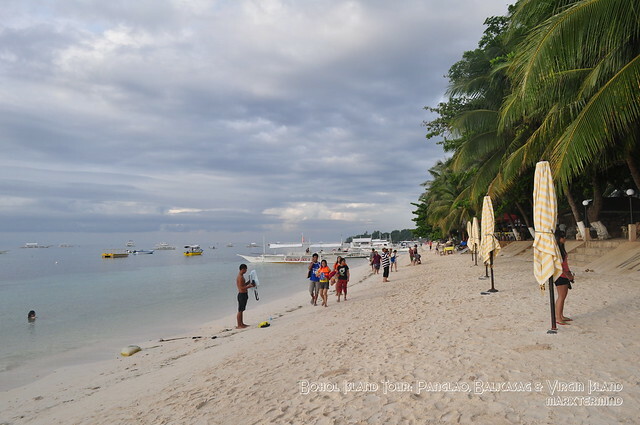 Then we left the island and back to Alona Beach. I felt short for this island. Maybe it’s the weather but it doesn’t look virgin anymore as what this island has been named. 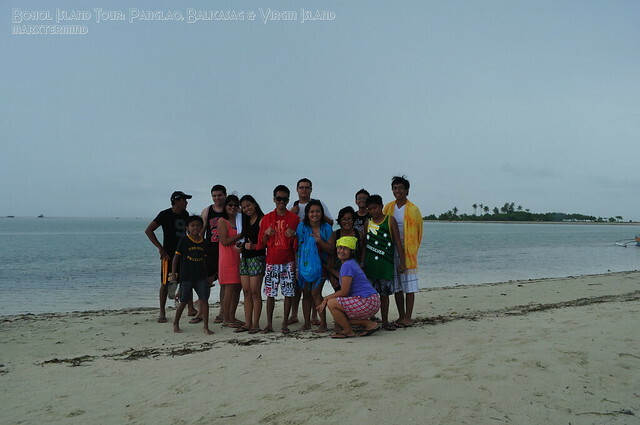 Nevertheless, Virgin Island is still beautiful and worth visiting. 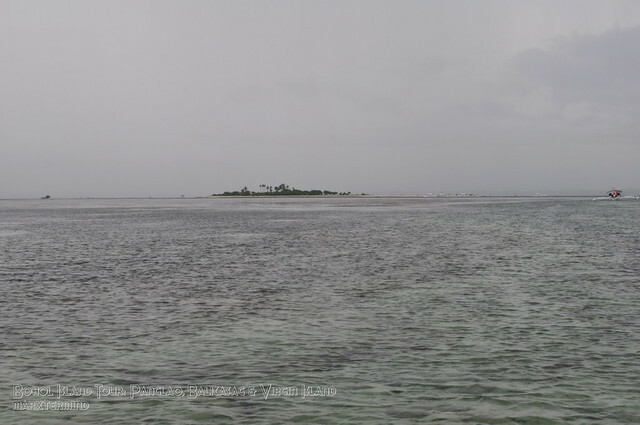 It was raining heavily as we went back to Panglao Island. This was worse than my boat ride experience in Caramoan though the waves were not bigger but I just couldn’t bear the rain. We were drenched in rain. It was a long boat ride passing through the rain. It was a relief when we reached the shore, finally! We went back to our lodging. I was too tired to get back to the beach so I dozed off and just waited for dinner to be served. It was our last day, some still had their flight from Cebu to Manila and some had their direct flight from Tagbilaran City to Manila. We contacted Kuya Ondoy to fetch us from our accommodation and take us to pier and airport. 9 of us left early since I had an early flight from Tagbilaran City to Manila and 8 of my relatives still had their flight in Cebu back to Manila. We parted ways in the pier. I went to the airport and waited for my first Philippine Airlines plane ride to Manila. I think yun yung standard rate, or ask mo si Kuya if pede kayo maki-join sa iba? Gusto ko din bumalik kasi di ko sya masyado naexplore and gloomy weather. Maybe summer is the best time. Weee pupuntahan namin to! I might contact na rin the same boatman na kinuha niyo kaso sana hindi masyadong mahal kasi 3 lang ata kami. Huhu. Kung mga travel bloggers ang kasama mo for sure pipilitin na gumising ng maaga para makita ang mga dolphins. Wahaha! 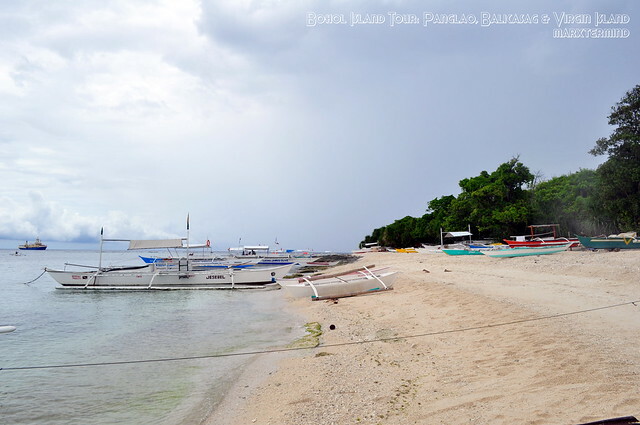 ganda naman ng beach….looking at the photos parang gusto ko na pumunta jan.
haha naaalala ko boatride namin from balicasag, rollercoaster din! parang napilitan lang si marx magkwento. hihihi! nanghinayang ako sa dolphin watching. yaan mo marx babalik tayo. ^_^ cheer up!